Odin's sacrifice of the self brought the Runes to humankind. To gain something of value for mankind, he hung himself for nine nights on Yggdrasil, the World-Tree, wounded by his own blade. Unaided and alone he was tormented by hunger, thirst, and pain. Before he fell he spied the Runes and with great effort seized them. During his suffering he lost an eye, but his sacrifice brought the Runes to humanity. 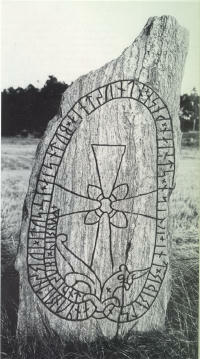 The Runes are associated with wisdom and self knowledge. Each character is a carrier of energy. It is a vessel of activity within nature and one's self which can be activated. The Runes have the power of divination and healing. They can also put one in touch with their inner self.